You can get all the icons and slides from Calendars 2018 timelines graphics (see details by clicking the pictures). Hi, I would like to share an experience of finding ways to manage my work and study time. I believe this can be an inspiration for anybody who needs to tackle several projects or jobs over a year. Currently, I study and have a part-time job. For some time I’ve had problems with planning everything – course classes, exams, preparing tasks for my job and other duties. That started my adventure with time management. I checked a few programs for scheduling tasks. Finally, I chose two apps that make my job easier until today: Nozbe for To-dos management and Evernote for note-taking. I still missed something where I could see the most important deadlines and projects in a single calendar view. 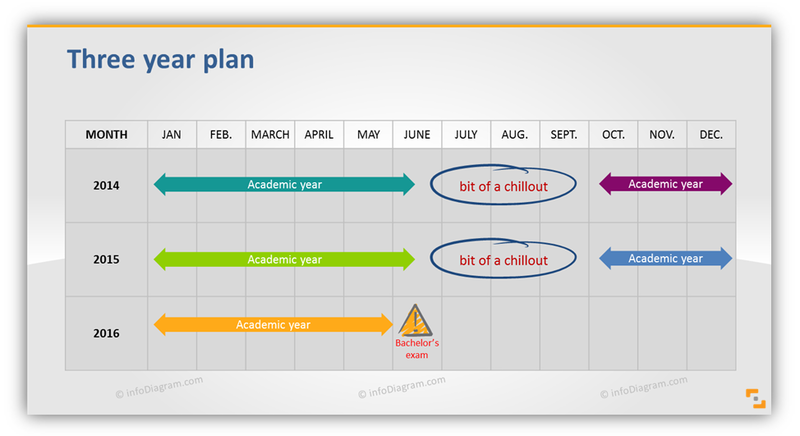 Here came handy a Calendar graphics slides by infoDiagram guys. I used it as my additional time management tool. I am using the calendar slides for a few weeks now, I realized it’s helpful to have complete insight into my main duties. I use Nozbe and Evernote to set tasks – writing notes, syncing with other sources. And slides with calendars is the perfect place to summarize everything. Managing calendars is very simple, even for people who are not experts in PowerPoint. I just move and copy the flags to show my deadlines. I change the table cell color as another mark on the days I work. As you can see from the picture – I put my most important tasks for September in the calendar. It allows me just to take a look at the calendar and know what I have to do and how to manage my time. I wanted to be able to see my calendars on the move, on my mobile. So I did some experimenting. I have a smartphone with Windows Phone system and slides look great. Despite the smaller screen, it’s pretty readable (here are screenshots from my mobile). Editing in mobile is not so handy, but I use my smartphone mainly for checking my plan. And the optional extras I type in notes. To sum it up, I think I found a way to handle my work-life balance quite effectively. Keeping track of tasks in Nozbe – good for smaller well-defined tasks. I am still open to checking new tools, so if you have anything I should try, mention it in the comments.